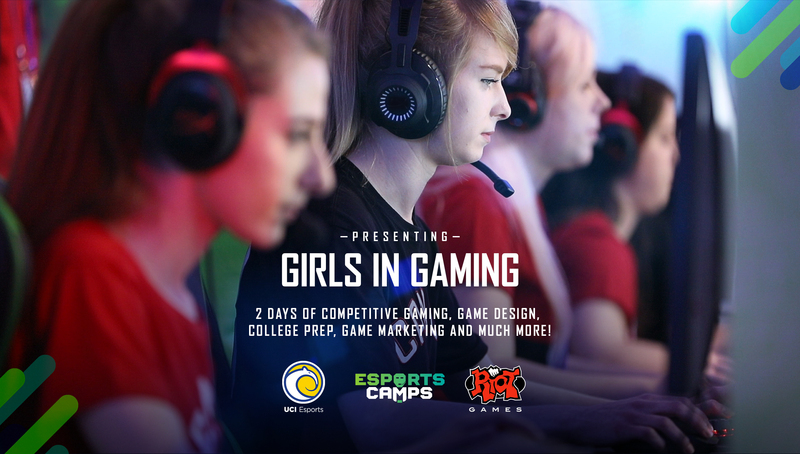 San Anselmo, CA — March 26, 2019: Esports Camps has partnered with UCI Esports and Riot Games for a special event for girls in gaming. This free event will provide a comprehensive overview of the esports industry and will feature guest speakers from Riot Games, UCI Esports and other top industry professionals. The goal of the event is to introduce high school aged girls to the many facets of the growing esports ecosystem which include: competitive gaming, game design, college prep, game marketing and much more. “We are thrilled to open up the Riot Games campus to educate and help inspire the next generation of female gamers. The esports landscape is changing rapidly; it will be a treat for us to share some of the ways in which we think about and work within this evolving space,” says Program Manager at Riot Games, Dennis Murphy. Riot Games’ League of Legends changed the face of esports through its influence on the creation of organized competitive leagues at the professional, college, and now high school level. Similarly, UCI’s early embrace of esports and devotion of resources towards building one of the nation’s leading programs and facilities has significantly buttressed the growth of esports, especially for student-athletes seeking to marry collegiate gaming aspirations with academic opportunity. Combining these two industry trailblazers to shed light on the esports industry will be an incredible opportunity for esports fans. Anyone interested in registering for the event can visit: www.esportscamps.com or contact us at 1-800-645-3226. Esports Camps, headquartered in San Anselmo, California operates esports developmental camps nationwide. ESC believes that an interactive environment focusing on the individual, team, competition, personal growth, community and FUN are vital to both game-skill and personal growth for aspiring gamers.